Consumers have been excitedly looking forward to Samsung’s introduction of the Galaxy Note 8. Partially because the device will not only be one of Samsung’s 2017 flagship and come with a number of new features and improvements, but also because consumers want to see exactly how Samsung responds to the debacle that was the Note 7. However, one potential feature of the Note 8 which has garnered so much attention is reportedly set to make an early pre-Note 8 appearance in Samsung’s Galaxy C smartphone. The word on the block is that the South Korea-based company actually wanted to design and build the recently released Galaxy S8 and S8+ with a dual-lens camera similar to the one integrated into Apple’s iPhone 7 Plus. The company also wanted to include a fingerprint sensor under the stunning Infinity Display on those devices but was forced to get rid of that idea and opt for the current design setup that we now know forms the Galaxy S8. Of course, as you would expect, Samsung has never actually officially confirmed that speculation, but there has been enough evidence to suggest it was definitely the case. It also seems that those desires for the Galaxy S8 will actually make an appearance in the Note 8 when it hits shelves in the second part of the year. Not just that, it also looks like consumers will get a glimpse of what the technology will look like prior to the Note 8 actually being released to the general public. That glimpse won’t be via an internal leak, but more due to the fact that there is a belief that the company will integrate that new dual-lens camera system into the new Galaxy C hardware first. 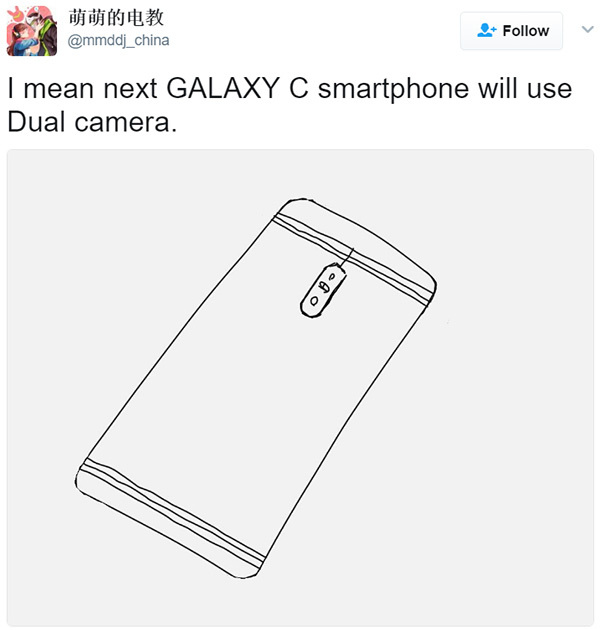 Posted by a Twitter user, a hand drawing of Samsung’s Galaxy C potentially outlines those plans. 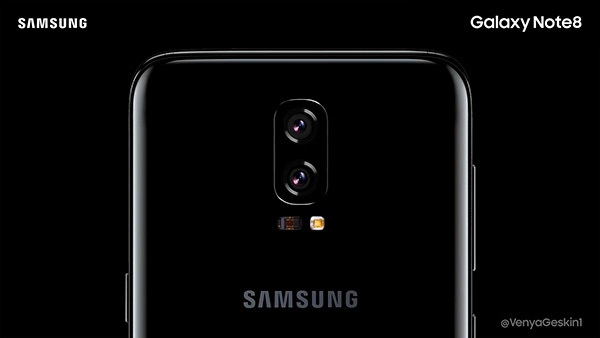 The dual-lens camera system is quite clearly shown in the drawing and will offer a vertical and horizontal orientation. There’s obviously a few reasons to doubt the authenticity of this, with the main one being that it is actually just a hand drawing of an outline of a device. However, it will be extremely interesting to get our hands on this device and see how the camera system functions if it turns out to be accurate.